This is the first all-time meeting between these schools. 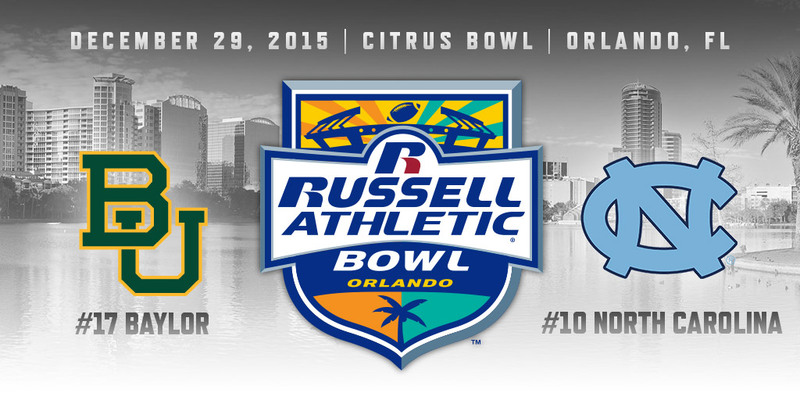 The Russell Athletic Bowl has gone by many names in the past (Blockbuster, CarQuest, MicronPC, Tangerine, Champs Sports). North Carolina beat Arkansas in the 1995 CarQuest Bowl here 20-10 (-2) and this is their seventh bowl game in the last eight years, including their third straight. Under head coach Larry Fedora, the Tar Heels are 1-1 SU/ATS and he was 2-2 SU/1-3 ATS in bowls as the head coach at Southern Miss. This will be Baylor’s sixth straight postseason appearance and they’re 2-3 SU/ATS. Head coach Art Briles was also 0-4 SU/1-3 ATS in bowls while the head coach at Houston. Baylor entered the season a legit contender for a National title as they returned 18 starters. Quarterback Seth Russell took over with out a hitch and won his first seven starts by 36 points per game, albeit against a soft schedule. Russell was then injured and out for the year (neck) and true freshman Jarrett Stidham took over, but the schedule got tougher. The Bears improved to 8-0, but then lost to Oklahoma. Stidham was then injured and lost of the year (ankle) vs Oklahoma State and they lost their final two, failing to throw for over 100 yards in each game! They lost third string quarterback Chris Johnson to injury against Texas and had to use wide receiver Lynx Hawthorne under center. Baylor did average 325 (4.6) rushing yards per game over their last three contests. North Carolina was the surprise team in the ACC. Despite 17 returning starters, including 10 on offense, which included quarterback Marquise Williams, there were plenty of questions about the defense. Fortunately, their offense had so much firepower, they were able to win the Coastal Division despite being No. 102 in the FBS, allowing 43 yards per game more then their opponents averaged on the season. The Tar Heels lost their opener to South Carolina, then won 11 straight and were within striking distance of Clemson in the ACC Championship game, but had a bogus offside penalty on an onside kick. They are No. 9 in the FBS, averaging 126 yards per game more then their opponents allow on average. Williams has had another fine season and running back Elijah Hood took over as the featured running back and has seven games with 100+ rushing yards this season. Baylor is going to enter this game with plenty of motivation after not being able to hold onto a big lead in their bowl game last year and entering this game having lost three of four. Briles is a terrific offensive coach and should have the quarterback position in a much better state. The defenses for both teams are similar stat wise, but Baylor has held their opponents to 56 yards per game below their season average, while North Carolina is allowing their opponents to gain 43 more yards then their season average. Against bowl teams, the Bears were plus 92.5 yards per game, while the Tar Heels were just plus 19.5 yards per game.